In 1922, the Commonwealth of Massachusetts appropriated $15,000 for the Massachusetts Agricultural College to purchase sixty acres of land lying immediately north of the existing Experiment Station. Known as the William P. Brooks Experimental Farm, the property was intended as a site for experimental work devoted to the dominant crops of the Connecticut Valley, tobacco and onions. This small homemade photograph album documents a picnic and group outing at the Brooke (i.e. Brooks) Farm at Massachusetts Agricultural College in September 1922. Although the participants -- over thirty of them --are unidentified, they took part in standard picnic activities, including a tug of war, three legged race, and rope jumping. The album contains labeled snapshots pasted onto thick brown paper, tied with a brown ribbon, and includes images of haying on the farm (with Stockbridge Hall in the background) and the homes of William P. Brooks and Prof. Arthur N. Julian. A dedication inside the front wrap of the album reads: "New Year Greetings to The Bullard Family from Mr. and Mrs. Nathan J. Hunting, 1923. Snap shots by Harry W. Fay." The Nathan J. Hunting and his wife Beatrice (Fay), the Bullards, and Harry W. Fay were all residents of New Salem, Mass., and Nathan J. Hunting was a 1901 graduate of Massachusetts Agricultural College. Although the album is labeled "Brooke" Farm, and though it contains an image of the home of William P. Brooks, it seems probable that the farm depicted is the newly acquired Brooks Farm. The photographs appear to have been taken from a location on or near the Brooks Experimental Farm. The homes of William Penn Brooks and Arthur N. Julian can be seen in the background. 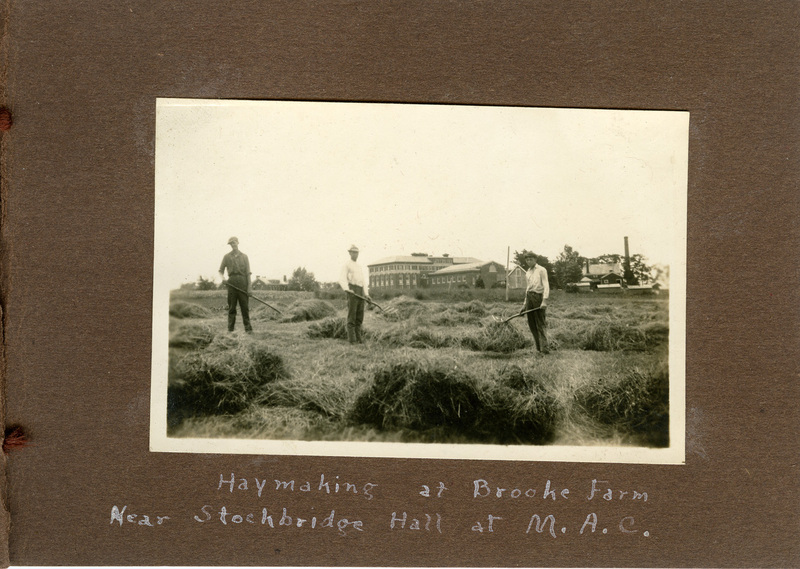 Haymaking at Brooke Farm, near Stockbridge Hall at M.A.C. The rear of Stockbridge Hall is visible in the background. Gift of Jean F. Hankins, Otisfield, Mass. (2005-016). Processed by Dex Haven, May 2011. Digitized versions of the images in this collection have been added to SCUA's online repository, Credo. Cite as: Summer Scenes, Brooke Farm, Amherst, Massachusetts (PH 037). Special Collections and University Archives, University of Massachusetts Amherst Libraries. Brooks Experimental Farm (Amherst, Mass. ).